Basil is the “King of Herbs,” but it isn’t just one plant. There are so many varieties from purple to chocolate to Thai, and even citrus. Citrus basil plants add a hint of fruitiness to this already delightful herb and are great for adding fragrance and flavor to your garden, home, and kitchen. Sweet basil is the variety of this herb that most people associate with it. It grows large, flat green leaves and has a sweet aroma and flavor that is reminiscent of anise, yet totally unique. This is the typical culinary and Italian basil, and it’s great, but there are other options. Citrus basil (Ocimum basilicum citriodorum) is a group of a few varieties of basil that are notable for a mild citrus scent. The plants are a little bit smaller than other varieties, growing to about 12 inches (30 cm.) tall. Lemon basil. Lemon basil is the most common variety of citrus basil and the one you will find the most easily. It has a mild, lemony scent and flavor. The leaves are silvery-green. Lime basil. This variety, as the name suggests, has a lime aroma and flavor. It may be more difficult to find, but is well worth the hunt. The leaves are bright green. Mrs. Burns’ basil. This unique variety of basil has a combination of lemon and lime in its flavor and scent. The leaves are bright green and the flavor is intense. Growing citrus basil is not really any different from growing sweet basil. If you have a successful herb garden already, you can simply add citrus basil to the mix. These plants grow well in beds and in containers outdoors or indoors by a sunny window. Basil plants of all types need good drainage and a lot of sun, although they will tolerate a little shade. If growing outside, don’t plant your basil until after the first frost. Light organic fertilizer or compost will encourage more growth. 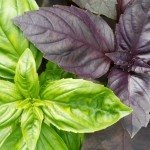 Pests are not usually an issue for basil, but root rot is. Don’t overwater your plants and make sure they are draining. Also important is to harvest leaves of basil plants regularly to encourage more growth and pinch off any flowers as they appear. The leaves won’t taste the same if they bolt. You won’t regret growing citrus basil in your next herb garden or even indoors in a container over the winter. The delightful scent is especially nice to have indoors during colder months.